Dr. Amy Winecoff, part of the Psychology and Neuroscience department, successfully defended her dissertation “Domain-General Affect: Mechanisms and Clinical Implications” this morning. Her talk, delivered in front of a packed house, was a riveting display of her work and what so many years at Duke will get you. More importantly, successfully defending her dissertation and earning her doctorate entitled her to wear the crown for the day. 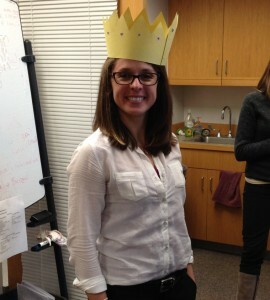 All joking aside, Amy did a great job (as everyone knew she would) both with her talk and her defense. We wish nothing but the best for Amy. Congratulations Dr. Winecoff! Libby Jenke recently passed her third-year (prelim) paper! This is the major mid-career paper in the Political Science Ph.D. curriculum. This is also the final, formal milestone before dissertation preparations (so you have a lot to look forward to, Libby). Again, congratulations! 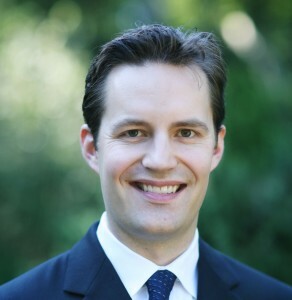 Former lab member John Clithero recently accepted a position in Pomona College’s Economics Department. Take a look at an article that was written about him and his future contributions to the field. The Huettel Lab recently hosted a social hour honoring the rivalry between UNC and Duke. While most folks in lab (and obviously at Duke) bleed a darker shade of blue, there are still some that tend towards the lighter side of this rivalry. Regardless, drinks, snacks, and good times were had by all. Click here to see some pictures.